As a freelance writer, one of the first tasks I had to undertake for my business was to build a portfolio website to feature all of my past work. It doesn’t matter whether you run a business or just want to find a career at another company–the portfolio website is a beautiful way to showcase your work. And you know what helped me? Having responsive portfolio WordPress themes on hand. The main purpose of a portfolio website is to wow potential clients or employers. As such, your portfolio needs to clearly communicate who you are, what you do and identify your target audience as well as present a solution to their immediate problem. Naturally, responsive design is a must these days, as well as the ability to customize your website to match your brand. A call-to-action is a welcome feature to encourage your website visitors to get in touch with you, ask for a quote, or best of all, immediately hire you. Why Are Portfolio Themes Useful? Let’s say you’re a web developer. Imagine how much easier it would be to send a link to your portfolio compared to modifying a resume for every client and sending it over as an email attachment. Resumes don’t show the true nature of your work, and employers are starting to realize this. Companies that hire people are more interested in live links or images of your actual work. That said, since many people don’t want to spend much money on a theme, it’s essential that we put together a list of the best ones currently available. Hopefully, these will help you save some money and put your best works on display. Read on for the compendium – and if you notice a free theme that’s not included and should be, please let us know in the comments section. We love to keep growing these lists! Allegiant is a responsive multi-purpose theme with a clean and organized portfolio that’s sure to grab the attention of potential clients. The theme starts off with a stunning slider at the top where you can share a brief description of your services or ways you help your clients. You can also incorporate calls to action to send visitors to other areas of your website. You can even feature members of your team and share testimonials to build credibility and take advantage of multiple page templates to add variety to your design. The theme also includes plenty of shortcodes so you can easily insert buttons, columns, accordions, and more without having to code them yourself. A blog section is perfect for displaying a recent feed of your posts and improving your search engine rankings. The theme can be customized on the back-end to integrate with your brand and you can easily change not only colors and fonts but layouts as well. It may not seem like Simpleshift is a portfolio theme at first, but it’s one of the most powerful ones on the list. It’s a completely free theme, and you can even upgrade if you’d like to gain access to more advanced features on the platform. In terms of a portfolio, it’s displayed in a beautiful grid-based layout and can be created in two ways. First, you can use the recent posts module and create blog posts for every single one of your portfolio items. Simply create a regular blog post for your most recent project, fill in the details, add images, and add links to the project websites. You can also use the recent posts widget to display those posts in the dedicated portfolio section. 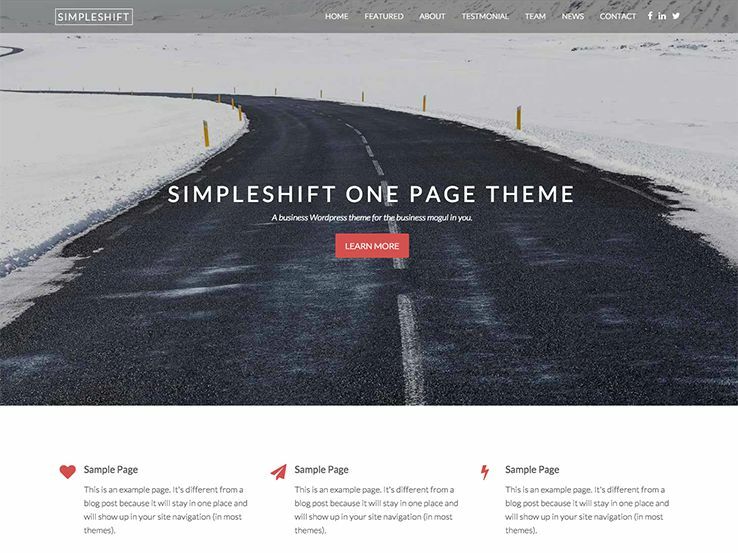 The Simpleshift WordPress theme is completely responsive so you can rest assured potential clients will be able to view your website and your portfolio even on mobile devices. This is truly an impressive theme that shouldn’t be ignored. The Venture theme from Nimbus is the ultimate free one-page template for any creative agency, freelancer, or design professional to build their portfolio. A one-page design means everything your visitor needs is displayed in one clean, thoughtfully designed page. This eliminates the need to scroll through multiple pages to get to the information your visitors are looking for. Gaga Corp by AccessPress Themes is a simple yet powerful WordPress template perfect for portfolios. The theme has a clean and minimal design comprising all the essential homepage sections. It is a multipurpose WP theme based on the live Customizer – now, building a complete website is easier and faster than ever. The theme offers various easy customization options – you don’t need to touch a single line of code working with this theme. Gaga Corp includes custom header options, typography selections, an attractive CTA (call-to-action) section, three footer widget areas, sidebar options and much more. You can design your website as per your wish. The theme is fully SEO-friendly and optimized to work flawlessly on any device and any browser. 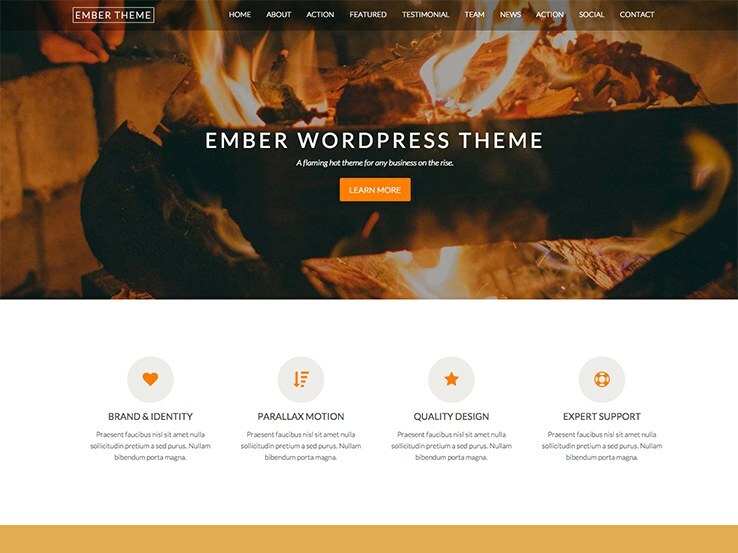 For the Ember WordPress theme, let’s start with the responsive aspect. It looks wonderful on smaller devices and it pairs nicely with the one-page design. This means that users don’t really have to sift through numerous pages, which can often become tedious on mobile devices like tablets and phones. The portfolio section is displayed as a list of the latest blog posts with featured images and descriptions that are all organized into a clean format. Create a new post every time you want to update your portfolio, add a featured image to serve as a project thumbnail, and add any additional details in the body of the post. Don’t forget to include a link so people can click on it and see the live website in action – it’s one of the best ways to convince potential clients you’ve got the skills they are looking for. 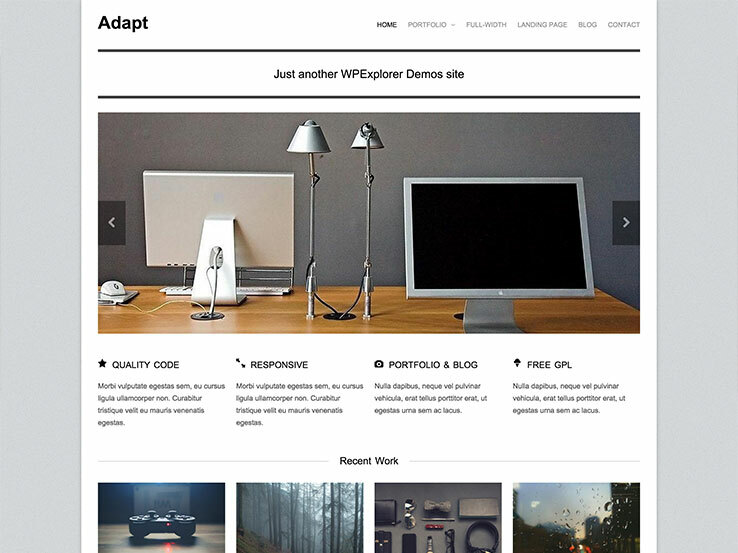 The WP Simple theme offers a mobile-ready, versatile layout with a minimal and clean design. This is a one-page theme that makes it easy to feature your portfolio right on the homepage. The header area is a great place to include a call to action that points your visitors to your contact form or your portfolio. Add a custom photo to take advantage of the stunning parallax effect. The portfolio area is included directly below the header, with a place for a short blurb about your work and portfolio items themselves which include a thumbnail and a short description of the project. You can click on either the thumbnail or the description itself to go to a separate post with more details about a particular project. This makes it extremely easy for potential clients to immediately see your work without having to click through multiple pages. 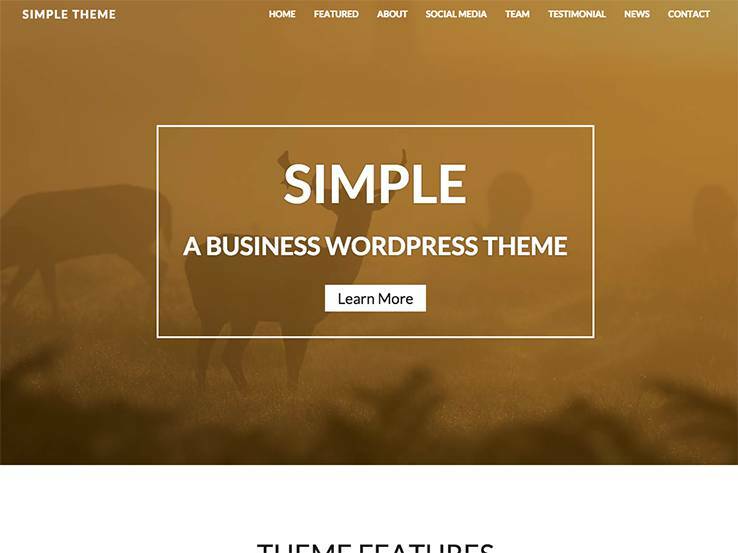 Don’t forget that the WP Simple theme also has various other features included, such as shortcodes, contact forms, and social media buttons. 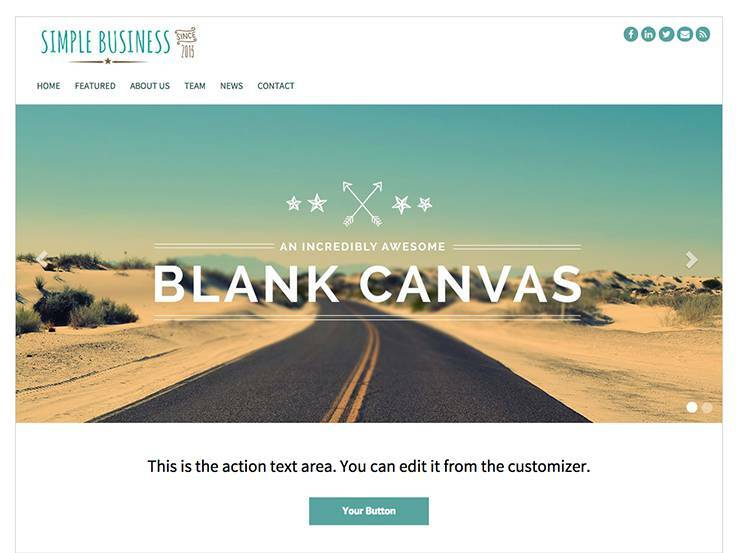 The Simple Business theme is the ideal website template for anyone looking to launch a business/portfolio website for a small business or startup. The theme is filled with powerful features allowing for modification of nearly all aspects of the website but it is also so simple to use that your website can be set up in a matter of minutes. As an offering from Nimbus Themes, your theme comes with unlimited access to our amazing support team that includes all of our developers, designers, and extended support staff. When you buy a theme you want to know there are real people backing it up and with Nimbus Themes that’s absolutely the case. 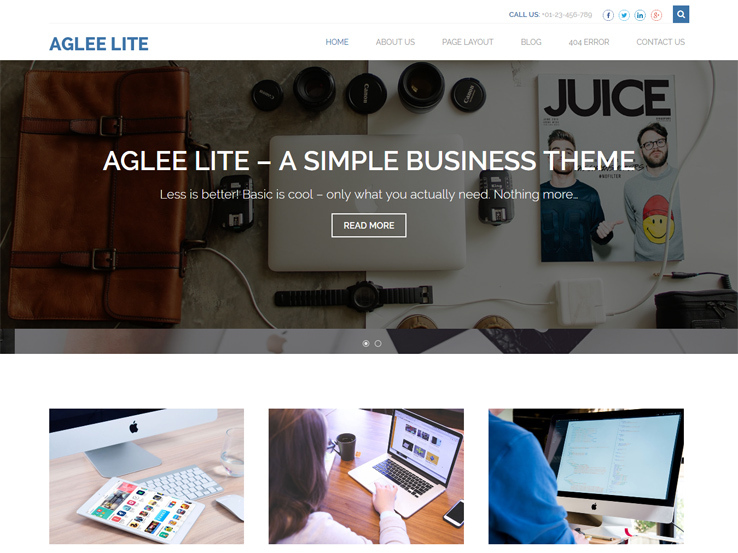 Aglee Lite is a clean and minimal free WordPress theme best designed for personal blogs, portfolios, and business websites. It comes with a simple yet elegant design with smooth functionality. It is a user-friendly theme loaded with many powerful features. The theme includes all the basic features and functionalities required to create a complete portfolio or business site. Aglee Lite includes multiple web layouts, an attractive featured slider, unlimited color option, custom logo/favicon section, and more. The theme is SEO-friendly, fully responsive, bbPress-friendly, supports RTL and is localization ready. In addition, it provides top notch customer support if you strike any problem while working with it. 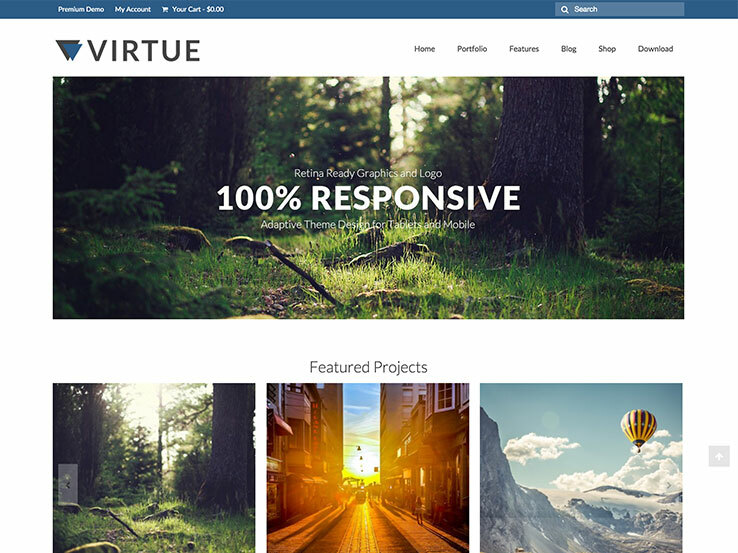 The Virtue theme is a portfolio theme that comes with a multitude of customization features. The theme includes a sleek slider and a clean interface, making it hard to believe it’s free. The theme comes with a complete portfolio page, and you can showcase these portfolio pieces on the homepage with striking thumbnails. The theme follows the latest trends of responsive design. The customization features allow you to customize your fonts, layouts, and sliders without touching any code. Hestia provides the perfect platform for building a responsive portfolio website. Communicating with your target audience, impressing them with your best works, and inviting them to make purchases or subscribe to your email list are just some of things this free portfolio theme can do for you. Additionally, Hestia is built using trendy material design meaning your flat web design will stand out from the rest of the portfolio websites circling the web today. You can build an online shop by integrating the popular WooCommerce plugin, translate your content to reach a more global audience, and know that Hestia is built using clean and validated code for optimal page loading speeds, overall website performance, and security from outside breaches. Moreover, Hestia’s custom background option supports multiple media types and the pre-packaged mega menu makes organizing your work, blog content, and online shop a piece of cake. In the end, this free portfolio theme rivals any others on the market today by way of features and overall design. The Portfolio Press theme gets right to the point since you can see all of the portfolio pieces on the main homepage. The thumbnails are the first things that grab a visitor’s attention and you can showcase anything from art to writing. The theme includes a powerful options panel where you can easily change your layout and upload your own logo and images. 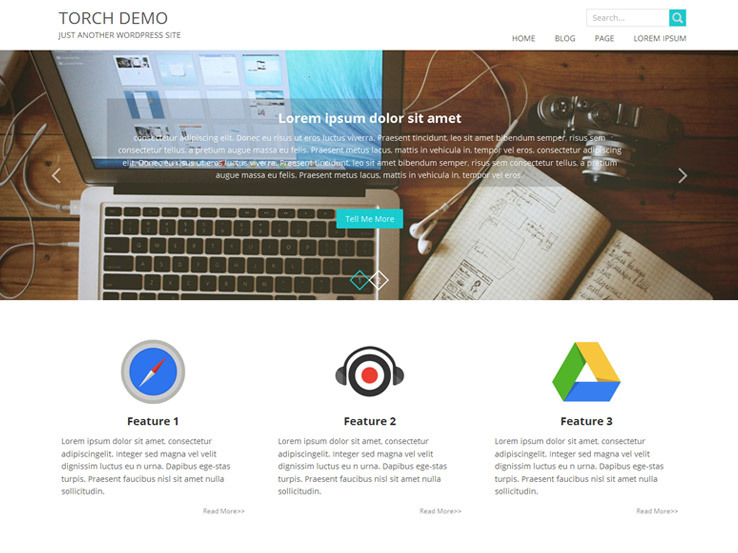 The theme comes in two formats: full width and narrow width. When you click on a portfolio item it brings you to a larger image and project description where you can include a detailed description of the project you worked on as well as links to the live project on the web. The Mixfolio theme has an interesting design because it provides a unique header where you can include a welcome message to your website visitors. This directly leads to your portfolio projects, which all have striking and large thumbnails for displaying your past work. The responsive theme also comes with a number of solid widgets for sharing your social feeds and more. Each portfolio item reveals a short description when a user hovers over it and then they can click to read a more detailed description. With its responsive design, Mixfolio is definitely an interesting option for your next portfolio website. The Photum theme is completely free and it works well for photographers since the photos are the main elements on the homepage. The navigation has been pushed to the left, making room for many photo thumbnails on the main page. The theme works well on all devices, and when potential clients click on individual photos, they can read more information about a particular project. The theme also comes with a simple theme options area for uploading a logo and adding Google Analytics tracking code or other scripts you might have to add. 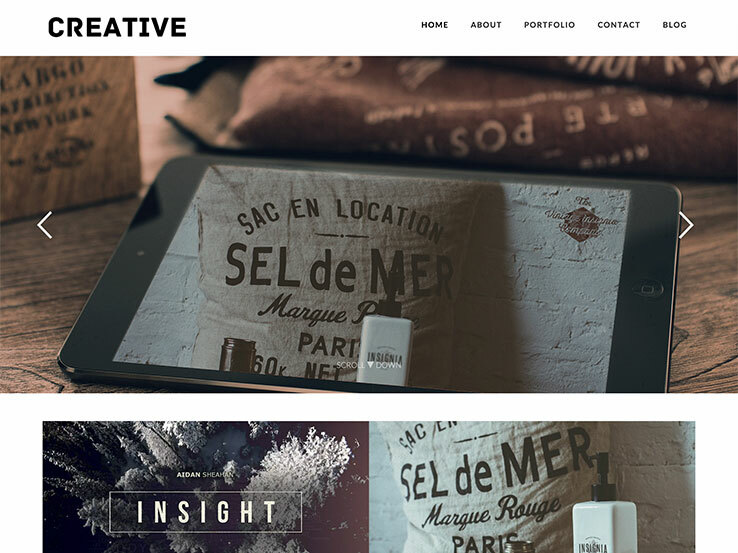 Overall, it’s a high-quality portfolio theme that puts your content at the center of attention. As another premium-looking theme, ArtWorks is definitely worth a look with its beautiful thumbnails and stylish designs. The theme comes with wonderful social integration, a large text header area for including a welcome message and simple ways for uploading backgrounds and logos. This theme is completely responsive, and it’s even search engine optimized so you can rest assured search engines will be able to easily index your website. Along with custom menus and widgets, you can’t really ask for more in a theme for showcasing your work. The Slider theme gets its name from the simple fact that the homepage is only a slider. This theme is bound to make a lasting impression on anyone who visits your website because it puts your most important content first. That way, when someone lands on your website, they will immediately be able to see your portfolio. It’s also a nice way to emphasize your best pieces. Other themes cut everything down to thumbnails until you proceed to the main portfolio pages. This theme shows nothing but large images, which ensures your potential clients will be more inclined to hire you. The Adapt theme comes from the folks at WPExplorer, and it’s a clean and free theme with plenty of customization options on the back-end. It’s a great choice for anyone who wants to build their portfolio website as quickly as possible. The theme includes various widgets and elements that make customizing the theme a breeze. You can organize the sections they way you want, whether you want to focus on your services or on your portfolio first. 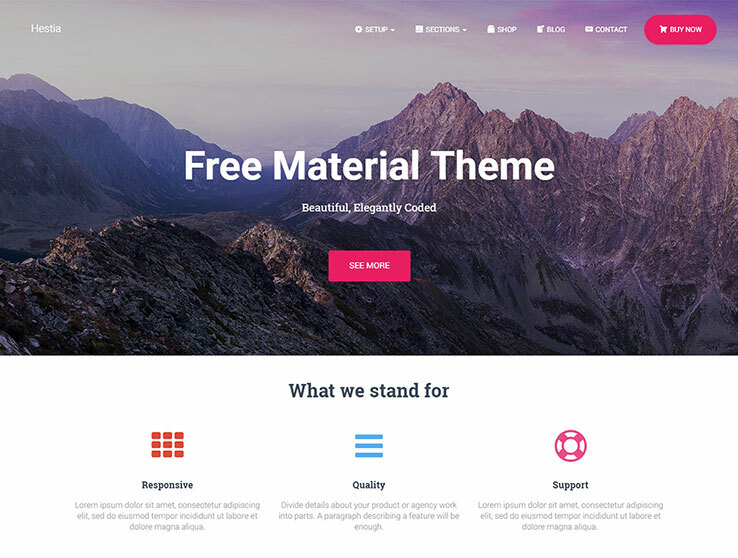 No matter what the goals for your website are, this theme can help you achieve them. 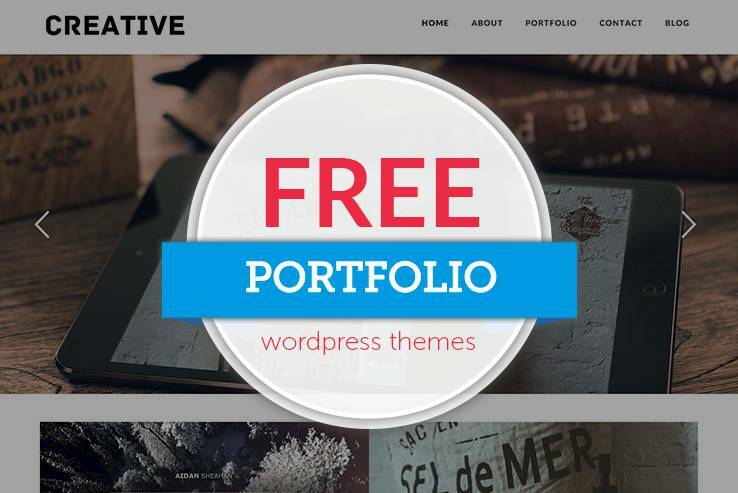 The Creative Portfolio theme is another free theme that has all the features of a premium theme. The homepage includes a gorgeous slider that’s perfect for showcasing your latest posts or your recent projects. A dedicated portfolio section is immediately below it. Everything on the website is responsive, including the slider, so your potential clients can view your work on a tablet, computer, or smartphone. The theme options are robust, and you can change the menu however you please. Keep in mind that you can also change the background to use your own custom background image or color. The Hatch theme has a simple and clean design that puts the main focus on photos. This makes it a great choice for any type of portfolio website. This theme lets you customize your background and header, as well as modify the layout and design since the settings page is organized and consolidated. You can also incorporate plenty of widgets in the footers and sidebars to make the site a little more interactive. The theme is fully responsive and looks good on any device so you can rest assured potential clients will always have the perfect experience when viewing your portfolio. 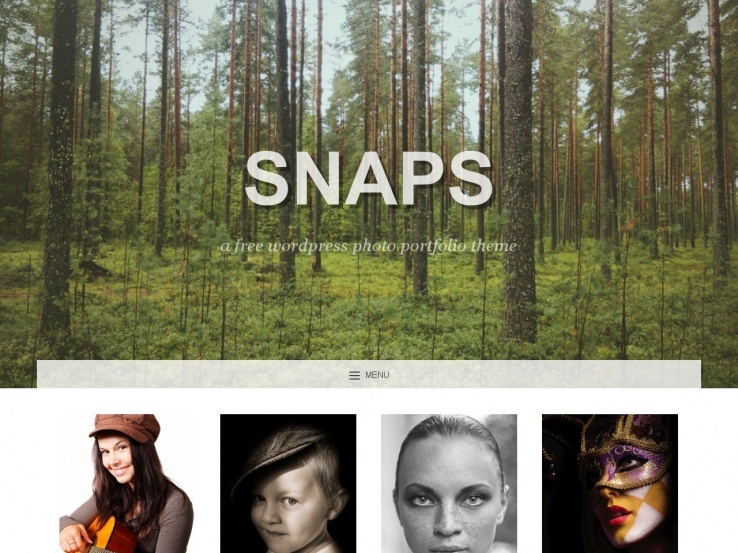 The Snaps portfolio theme is the perfect choice for any photographer looking to create a portfolio website. 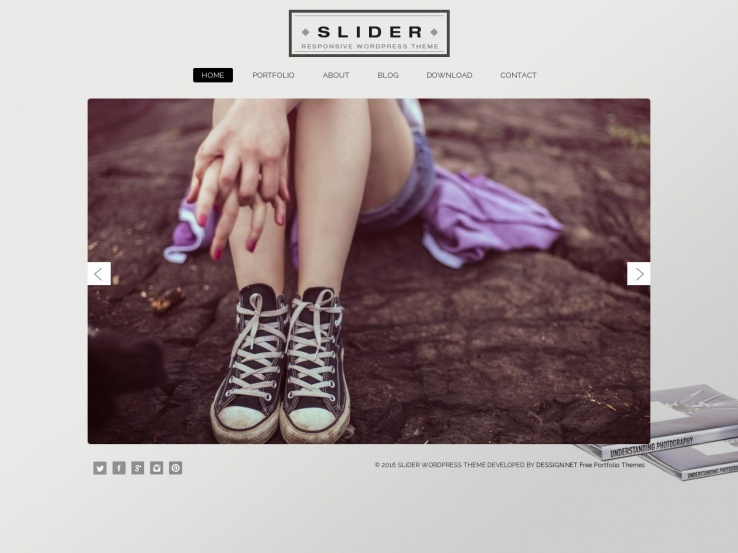 The homepage includes a stunning slider and large featured images to feature portraits, landscapes, stills, and more. The theme is lightweight and minimal. Once a visitor clicks on a portfolio item they can view additional information about a particular project or a photo shoot. 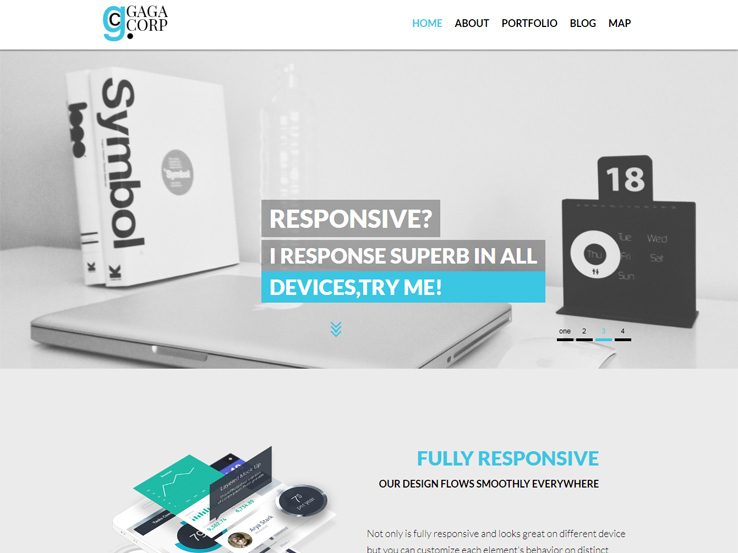 In terms of design, the theme is fully responsive. I would highly recommend using the Snaps theme if you want a quick and easy way to get your content online. 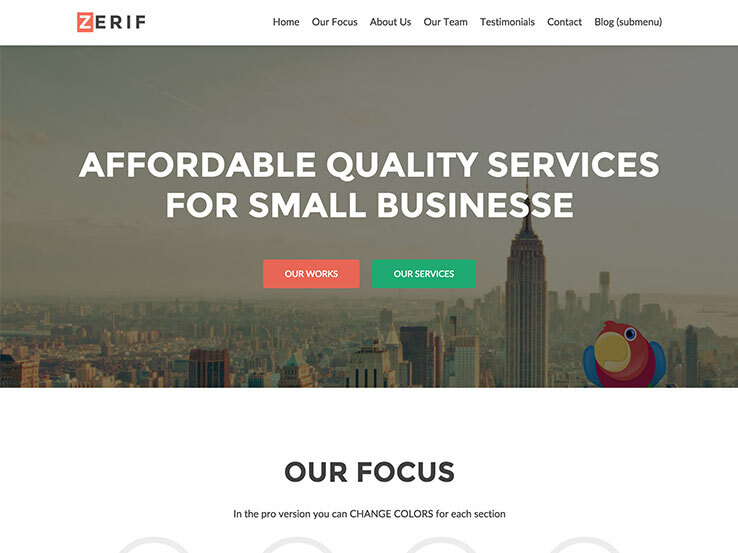 As one of the top ten most popular themes on WordPress, Zerif Lite is worth looking into for those interested in an elegant theme for your portfolio. 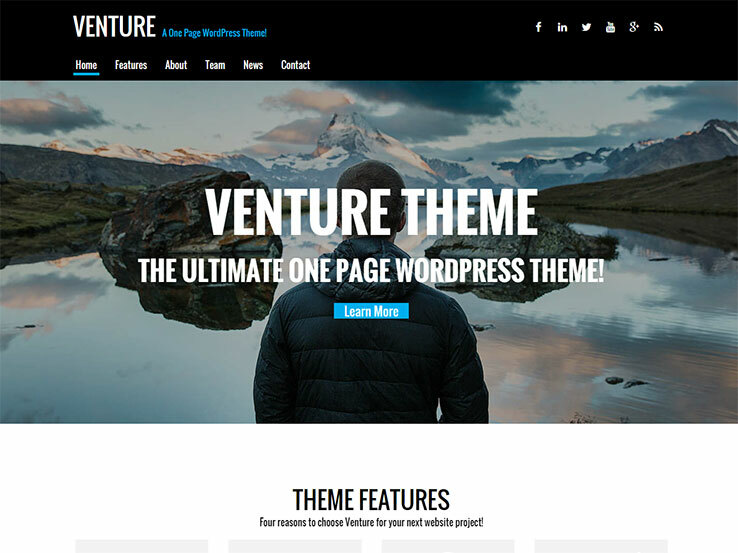 The free theme is built on a single page, meaning that all of the content is placed on your homepage, eliminating the need to click through multiple pages. The modern and flat design is also mobile-responsive so your visitors can enjoy your website even on mobile devices. Zerif Lite works well with WooCommerce in case you plan on selling any merchandise, and the parallax effects are a great way to add visual flair to your website. The custom backgrounds allow you to add a touch of your brand while the threaded comments encourage user interaction. Finally, Zerif Lite is translation-ready, which means you can translate your website into any language you want. 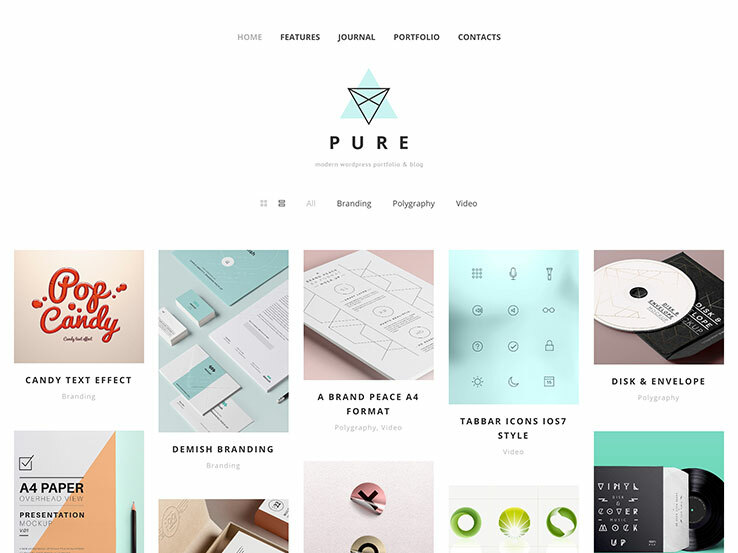 The Pure WordPress theme is a favorite because of its style and simplicity. The full-width design has plenty of space to include all of your portfolio projects without making your website appear cluttered. The responsive design makes sure your website looks great on mobile devices, and the grid and masonry layouts add a unique visual appeal. Choose from five different header styles to find the one that best matches your brand. Although this is a free theme, developers can get their hands dirty with CSS and HTML files, and the GT3 Page Builder Plugin is ideal for those who don’t want to work with code. This page builder lets you simply drag and drop elements to make your designs look stunning. The powerful admin panel allows you to customize any aspect of your website, including adding custom fonts via Google Fonts. Along with FontAwesome icons and translation ready elements, you can’t go wrong with the Pure WordPress theme for your portfolio. UPDATE: We’ve received some strongly worded feedback from a reader about the support provided for this theme. Please see the comment below from Pallavi. Check out the Torch theme if you’re one of those creatives who wants to add a more business-centric look to your online portfolio. 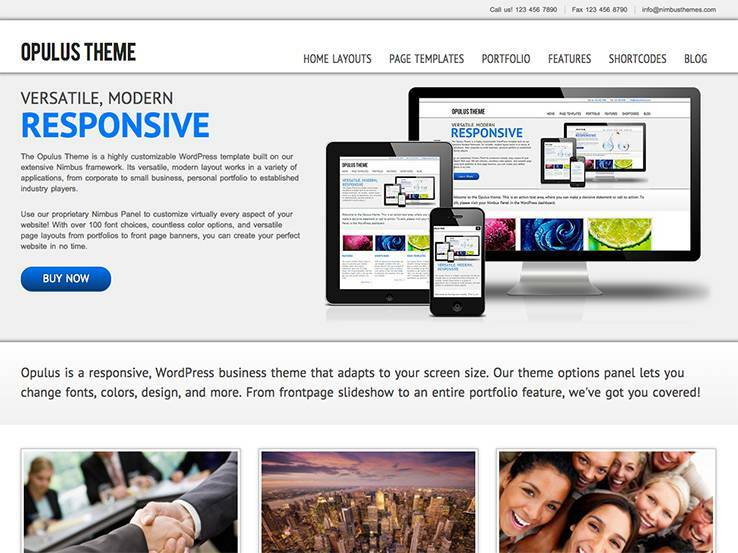 This is a completely free and responsive theme that works we-l for personal and company websites. The fullscreen sliders are ideal for showcasing your latest posts or projects or highlighting your services, while the custom widgets allow you to add extra content to your sidebars and footers. The theme includes various social icons so you can easily grow your social media following. The Torch theme is translation ready, which makes it easy to translate your entire website. Additionally, you can upload your logo and favicon through the back-end of the theme. The admin panel provides an easy interface for customizing your website’s colors and more. You can also add a slider in the sidebar area with the help of a widget. Overall, the Torch theme is a wonderful choice when it comes to a portfolio since it gives you galleries to display your best work. I still can’t get over the brilliance of the Pinterest layout. It’s an ideal way to show off your best work. Pinbin is a clean, minimalistic, and responsive WordPress portfolio theme that’s perfect for graphic designers, web designers, photographers, and anyone who likes to put their images and artwork first. Because of its minimal design, the theme eliminates all distractions and puts the main focus on your most important content. The Pinbin theme has clean and optimized code that ensures your website will load fast. 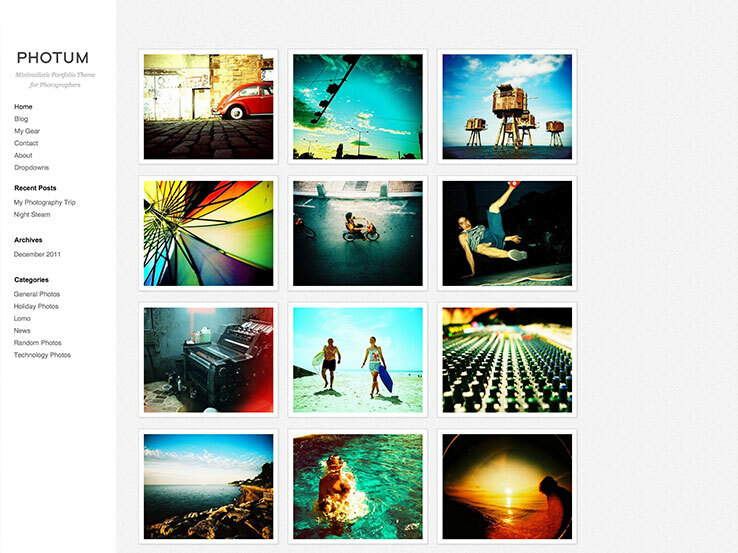 All you have to do is upload your featured images and the theme does the rest for you. The theme also comes with a logo upload area so you don’t have to work with any code. The best part about this theme is the fact that clicking on individual portfolio items will reveal a larger image along with more information about that project. You can add additional images to provide a more detailed view and you can add a thorough description of everything you did. Pinbin is definitely a theme you shouldn’t ignore. 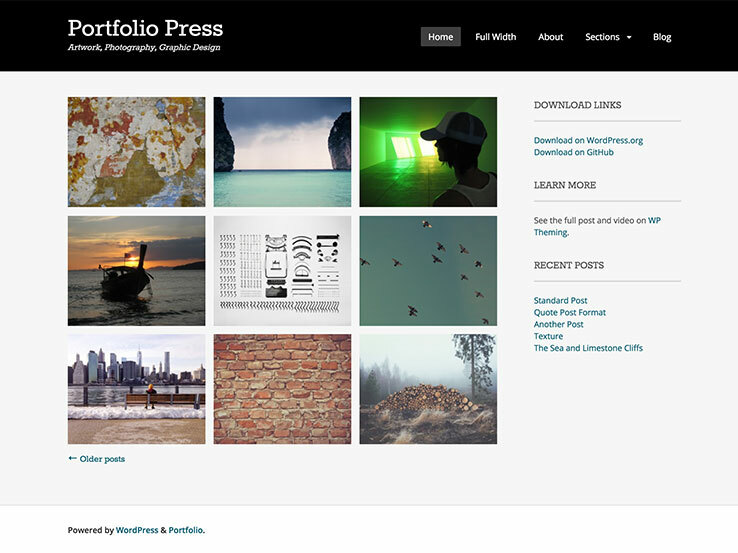 With OnePress, you gain access to a remarkable feature set for your portfolio. 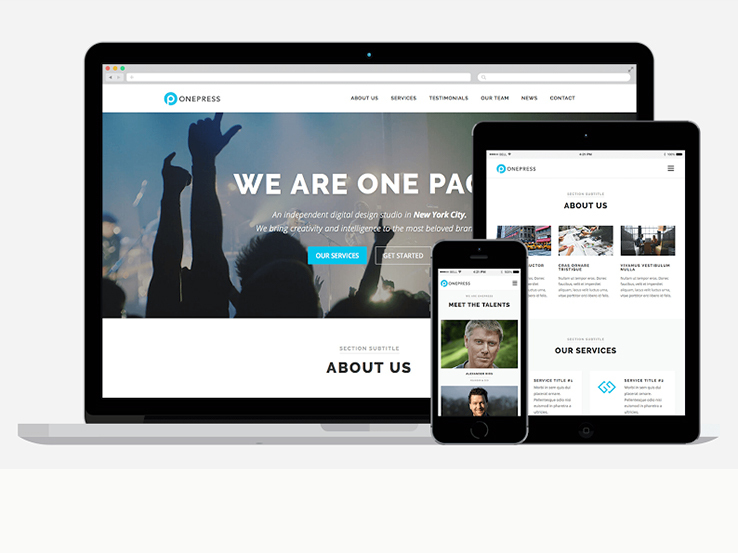 OnePress is a one-page theme with responsive elements and beautiful sections with smooth parallax effects. The theme offers complete localization and page speed optimization which ensure that potential clients are more likely to view your portfolio. As for the portfolio itself, this theme lets you use videos or images. The main gallery is great space to showcase thumbnails with links to click through for more information. As with most one-page themes, the OnePress theme provides several content sections where you can feature your team members along with their profile photos and social media links. Include your own social media buttons, email signup forms, contact forms, and more. The Recent News widget is ideal for displaying your latest posts and various counters add a touch of animation and flair to your website. The parallax effects are scattered throughout the entire homepage, and the slider includes overlaying text and buttons that can be used as calls to action. Overall, we enjoy OnePress for its simplicity and functionality. 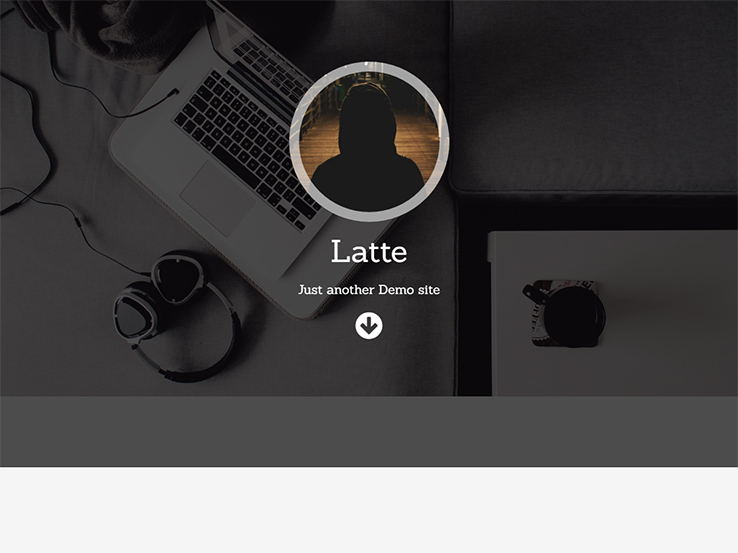 The Latte WordPress theme is an impressive portfolio solution for photographers, freelance writers, agencies, and other creative people. The theme is completely responsive and it puts the main focus on the primary content. The customization tools on the backend are far more powerful than an average portfolio theme. For example, you can customize which social media icons reside on your homepage, and the colors are virtually unlimited. Change fonts and add a stunning portfolio to wow potential clients. The header module has a parallax effect, which is a great way to grab the attention of your visitors and highlighting your services. This is also the perfect spot to add your own logo or images that highlight your past work. The About Me section is a nice way to explain how you help your clients while the services section is packed with icons and columns, both of which make your presentation more creative and professional. Add a blog section to connect with your audience and share your best tips and tricks related to your industry. Or if you are a writer, use the blog as a way to convince potential clients you are the right person for the job. The navigational menu is initially hidden behind a small button that reveals a full menu on the left-hand side. Finally, you can easily adjust the look and style of portfolio thumbnails, which provide more information about a project when someone clicks on them. Opulus is a tried and true solution for anyone looking to set up a portfolio website using WordPress. This theme has been downloaded hundreds of thousands of times and has been used with success by everyone from Ivy League universities to solo contractors and even artists and tradesmen. Like all the themes from Nimbus Themes, it comes with support from everyone on our team and includes powerful customization options, SEO optimized code, various shortcodes, and much more. The theme also features clean design and gorgeous typography to make sure your portfolio stands out from the competition. 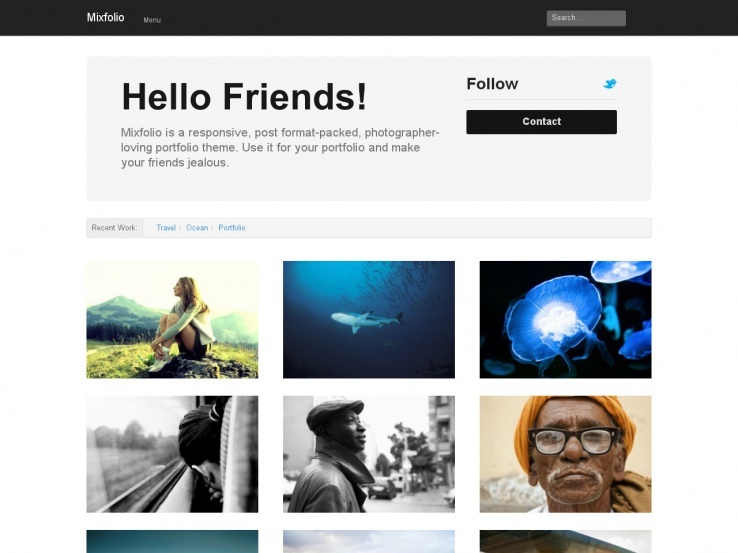 That’s it for the best free portfolio WordPress themes. Let us know in the comments section if you can think of any other free portfolio options you have used with success. I personally think the most important part of a portfolio theme is direct access to your past work, followed by a responsive website. Regardless, share thoughts about your adventures trying to build the perfect portfolio. Thanks for sharing such a nice collection of WordPress Portfolio themes. All themes are really nice and I am sure such themes will accomplish all the needs of the users. 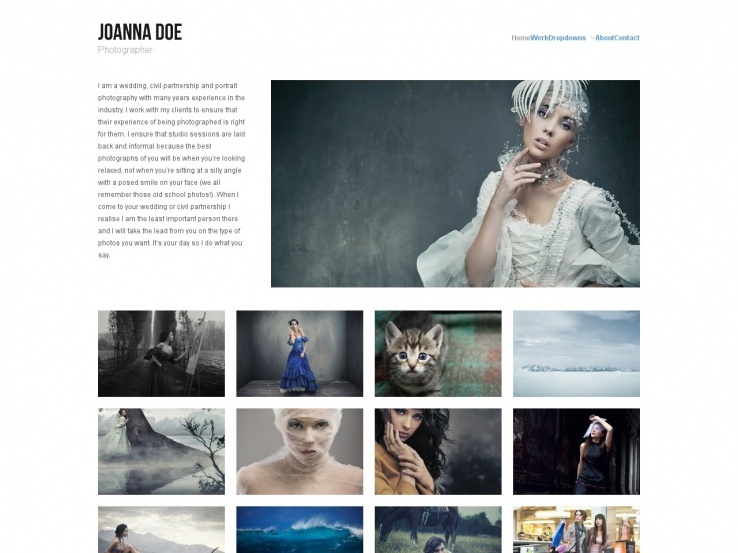 Amazing collection of WordPress Portfolio themes. Really useful post with nice collection of themes. Mantra, Asteria WordPress themes I like the most. 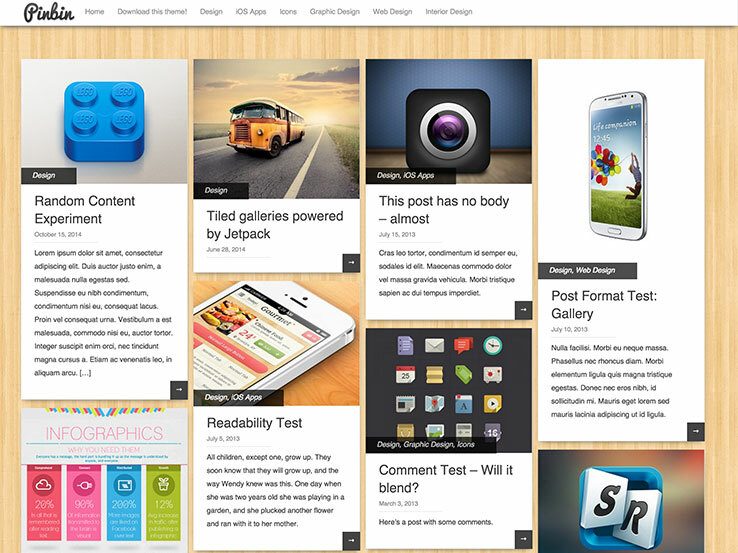 I will surely use these themes or will try to design it with the help of templatetoaster. Thanks for sharing such a nice collection of themes. Nice collection of WordPress Portfolio themes. Thanks for sharing. All themes are really amazing and will surely give an appealing look to related websites. Well, I am new to designing and trying to create a WordPress Portfolio theme by myself using a designing software template-toaster and dream weaver. Nice collection, Please remove “Pure” from the list. I tried it, spent one day in reading documentation in testing it on my site but in the end the code quality was pathetic and it didn’t work as it does in demo. Lots of people had same issues on their support page. Many questions remain un-answered. They should care about people’s time and energy. Hi Pallavi, thank you for the feedback! I’ve added an update in the description for the theme with a link to your comment. Amazing collection, most of the themes are amazing except Mantra. I think that it looks really unprofessional and doesn’t belong in this list + it’s kinda outdated. We are glad you found the rest of the roundup helpful! it, you are a great author. I will make sure to bookmark your blog and will come back later in life. Thank you so much for the kind words, and hope you have a great weekend too! Hi, great selection thanks. I haven’t read every comment but I wanted to know which of the themes that support video have an online payment gateway? You might have better luck looking through our Best Vide Roundup, and then adding an eCommerce plugin like WooCommerce. Hope this help! If anyone has a better suggestion, I would love to hear it.